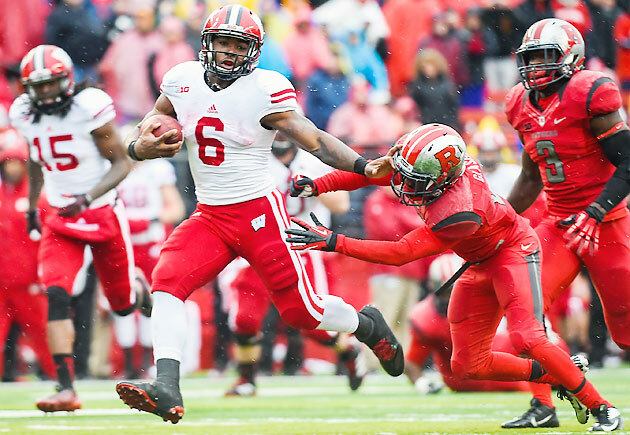 Corey Clement is next up in Wisconsin's long line of elite running backs. Get to know the powerful runner who will try to fill Melvin Gordon's shoes. Every college football season brings a lot of roster turnover. To get you ready for the 2015 campaign, SI.com presents the Off-season Spotlight, a weekly feature on a player whose name you’ll want to know by the fall. Last week, we focused on TCU senior wide receiver Kolby Listenbee. This week we shift our attention to Wisconsin junior running back Corey Clement. Clement is next in a long line of prolific Wisconsin running backs. The junior takes over for Melvin Gordon, who rushed for 2,587 yards with 32 touchdowns in 2014 and finished second in voting for the Heisman Trophy. Before Gordon, James White, Montee Ball and John Clay all compiled 1,400-yard seasons in Madison. With Gordon gone and Wisconsin’s shaky passing attack, Clement will likely be a focal point of first-year coach Paul Chryst’s pro-style offense. Senior quarterback Joel Stave returns, but he was severely inconsistent last year, completing just over 50% of his passes with more interceptions than touchdowns. The offensive line loses three starters, including right tackle Rob Havenstein. Clement must adjust to having the spotlight to himself this fall. Wisconsin fans have witnessed Clement’s gradual rise in Madison. The junior has played in 26 games in two seasons, rushing for 1,496 yards with 16 touchdowns. As a freshman in 2013, Clement scampered for 547 yards on 8.2 yards per carry while backing up Gordon and White. Clement’s production increased to 949 yards and nine touchdowns as he became the Badgers’ No. 2 back last season. A New Jersey native, Clement earned Big Ten Offensive Player of the Week honors on Nov. 1 after tallying 131 rushing yards with two touchdowns against Rutgers. He capped the 2014 season with 105 rushing yards and a receiving touchdown in Wisconsin's Outback Bowl victory over Auburn. While Gordon’s incredible production garnered the Heisman attention last season, he needed to team up with Clement to set another record. The two backs combined for 3,536 rushing yards last fall, setting an FBS record for rushing yards by two teammates. Not surprisingly, another pair of Wisconsin rushers held the previous record (Gordon and White compiled 3,053 in 2013). Dare Ogunbowale and Taiwan Deal competed this spring to earn the No. 2 spot behind Clement, but there’s no secret as to who will star in Wisconsin’s backfield. Clement didn’t get a chance to wow onlookers in the Badgers’ spring game, as Chryst gave his budding star the day off while Deal and Ogunbowale shouldered most of the rushing load. But Clement, who has a career average of 7.0 yards per carry, used the rest of the spring to hone his conditioning and leadership. "I think strength-wise, core, just for stability for when I run, just [getting] my stamina up has actually helped me a lot,” Clement said after the spring game. “I don't have to bend over after ever play. I think I've become more of a vocal leader to my offense and to my teammates, especially for the running back group. In the film room, we are able to adjust to a lot more things and become more open to suggestion as to what is going to better this offense." Clement also spent time with Gordon during practice as the former Badgers star prepared for the NFL draft. On a few occasions, Gordon got in Clement’s ear to offer pointers to his successor. "He's picking my brain, too, just like (when) he was out here a while ago. He said...‘What down front is that?’" Clement told the Associated Press. "He's always going to be Melvin. He's always going to be competing with me on or off the field." It’s probably smart to not mess with Clement off of the football field, either. According to his Twitter account, he took on a few Wisconsin teammates in paintball this spring. Catch up on what Wisconsin fans already know and watch the best moments from Clement’s 2014 season.